TAMPA, FL – The Sustany® Foundation, a nonprofit organization dedicated to enhancing the quality of life of the Tampa Bay community by promoting sustainability, has announced the selection of Jennifer Silva as its new executive director. Silva will take on leadership of the Sustany® Foundation as the organization looks to grow and increase its impact in the region. “Jennifer brings a wealth of experience working in the non-profit field in important strategic capacities, and our board is excited about the skill sets she brings to the role,” says David H. Reed, President of The Sustany® Foundation and President of Shepard Capital Partners, LLC. Silva comes to the Sustany® Foundation with 18 years’ experience in the nonprofit sector as a manager, fundraiser and communications professional. She is a Florida native and earned her BA in Humanities from the University of South Florida. 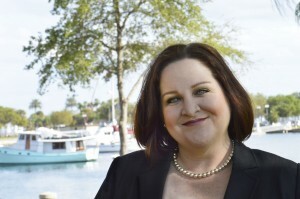 Silva previously served as Managing Director of the Sarasota Film Festival, Executive Director for Clothes To Kids in Pinellas County, and Development Director for Tampa Bay Watch. About the Sustany® Foundation: Founded in 2007, the Sustany® Foundation supports sustainability through education and programs which advance economic prosperity, environmental stewardship, and social responsibility. They strive to be the leading facilitator of sustainability through efficient and effective aggregation and investment of resources for Tampa Bay’s citizens today and into the future. How did you get your start in the non-profit sector? My first job out of college was with the American Stage theatre in St. Petersburg. I was initially hired as a marketing assistant, but during my five years with the organization I wore many hats. From Box Office Manager to Director of Communications, my roles at American Stage provided me with a valuable education in nonprofit management, fundraising and marketing/public relations. I am a Florida native and a long time Pinellas County resident. I attended the University of South Florida where I received my BA in Humanities. I have always had a passion for environmental and social issues and I knew early on that I wanted to spend my career making a positive impact in my community. I love to read and the book on my nightstand at the moment is Cradle to Cradle: Remaking the Way We Make Things – it is a great read for anyone who wants an eye opening look at how we produce and consume, and what sustainability can do for business and planet. I currently live in St. Petersburg with my four pets – two cats and two dogs. What would you tell someone who is concerned about what they can do for sustainability? I would tell them that anyone can make a difference. You have power, regardless of financial resources or time constraints. Just supporting causes that align with your values and passions can make an impact. When it comes to sustainability, small changes can go a long way. There are many resources out there with tips on living sustainably – resources that are free and easily accessible. With a little bit of research, anyone can become a champion of sustainability. Sustany® is a non-profit group that is focused on bringing awareness to Tampa Bay people and business. What are your goals as the executive director? As the Executive Director of the Sustany® Foundation, my goal is to grow the organization and increase its impact on the Tampa Bay region and beyond. For most of its 8 years, Sustany® has been driven by a passionate and hard-working team of volunteers. I want to support those amazing volunteers and help take their efforts to the next level. Most of your career has been in the non-Profit arena. Why and what surprises you most about non-Profits? I have always been driven by a passion for making a positive impact in my community and beyond. Working in the nonprofit arena has been a way for me to make a living while making a difference! Despite working in the nonprofit world for more than 18 years, I am regularly surprised and impressed by the many amazing people who support nonprofits – from staff to volunteers to donors. There are so many genuinely caring people out there who put so much of their energy and resources into causes that move them. It is truly humbling and inspiring to be around these people every day. Being involved in nonprofits professionally is a wonderful way to maintain one’s faith in humanity and to be aware of the good that we are capable of as human beings. What are the biggest challenges currently facing sustainability in Tampa Bay that the Sustany® foundation is working on? One of the biggest challenges is getting the message across that sustainability is for everyone. Sustainability is good for business, it’s good for society and it’s good for the planet. Another challenge is in making the concept of sustainability accessible, to talk about sustainability in terms that everyone can understand. How can business make more sustainable choices? The first step is to embrace sustainability as a way to drive profits while doing what is best for people and planet. Businesses can work with Sustany®’s Sustainable Business Program – this program partners Tampa Bay businesses with sustainability experts to identify and adopt best practices that encourage economic, environmental, and community accountability.